SOURCE: A report by the Centre for Research on Socio-Cultural Change (part of the University of Manchester and the Open University) observed: "the remarkable result is that under Mrs Thatcher from 1979-90, just as under Tony Blair from 1997-2007, the real value of Housing Equity Withdrawal is larger than the real value of GDP growth"
Spending our property wealth led to the economic crash in 2008. 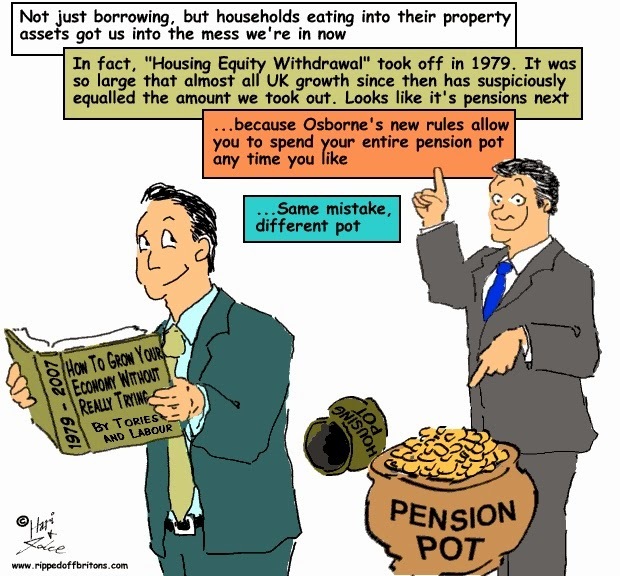 Will Osborne’s new rules allowing us to spend our pension pots lead to another? OECD report shows greater inequality is bad for growth. So why are the Tories pushing up inequality by cutting back the welfare state? With highest pay and highest job growth is London sucking the life out of Britain?